October was a somewhat busy month this year, and also a month where I backed off social media quite a bit. I would check my Twitter, Facebook feeds daily, Google+ not so much, I read blogs but only seemed to have the energy to comment on a select few. My mind itself was blank, not really knowing what to blog about. At the beginning of the month we celebrated Thanksgiving here in Canada. Our two kids who still attend College and University out-of-town were able to make it home, putting a very large smile on mom’s face. I see middle child much more often since she is only a few hours away, and is able to commute home every other weekend with one of her classmates. Whereas, I had not seen the young man since the beginning of September, he is a good nine hours away in Quebec. He arrived home well after midnight, and though very tired, gave his mom one of the hugs you really never want to end. We celebrated Thanksgiving at home again this year, I do miss going camping during that weekend, but it is far too difficult to coordinate. 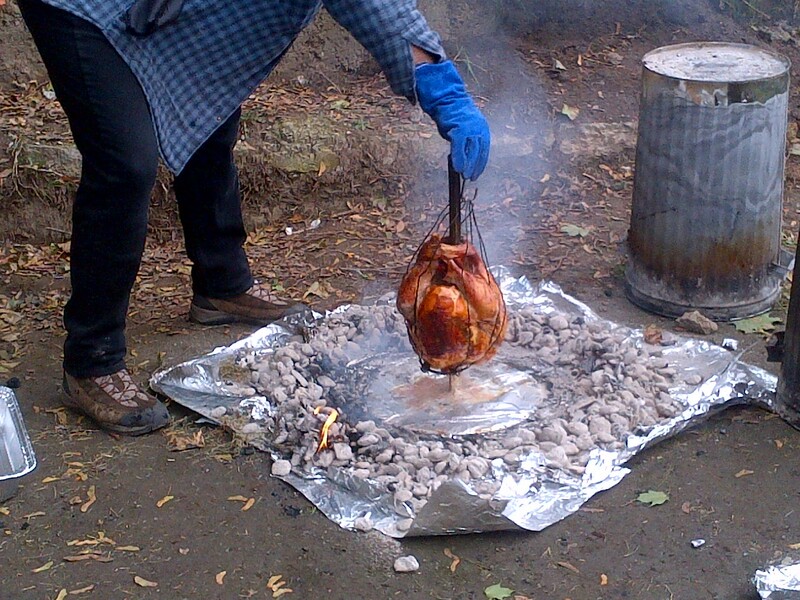 Instead of baking our turkey in a conventional oven, we baked it in the backyard in a garbage can. Sounds completely weird, but a twenty pound turkey is cooked in roughly two hours and is delectable. Everyone complimented on how well it tasted, it literally melted in our mouths. If you are interested in viewing the video, you can see it here. Please note that Cocoa did have a taste of the turkey before baking, but we figured since we were cooking it at such a high temperature, a few licks of the turkey was no big deal. 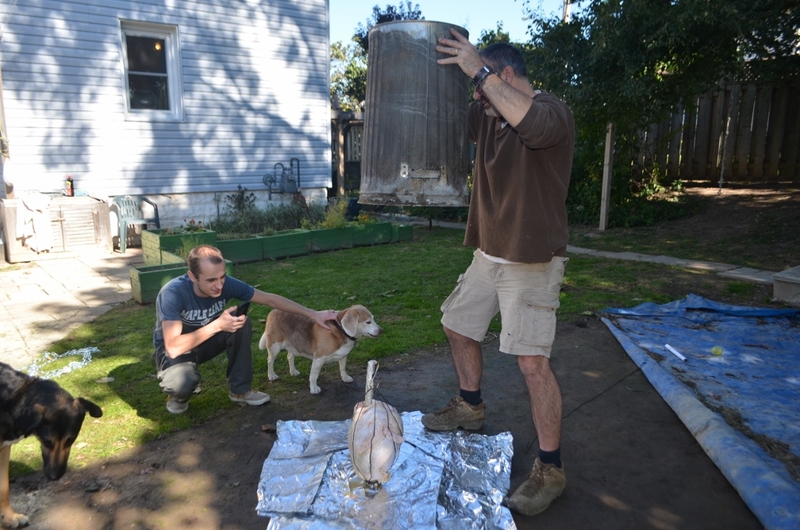 The turkey is ready for baking; in this picture we have our son, the young man, beside him is Cocoa the beagle, then my husband Matt, and in the far corner is middle child’s dog Bear. 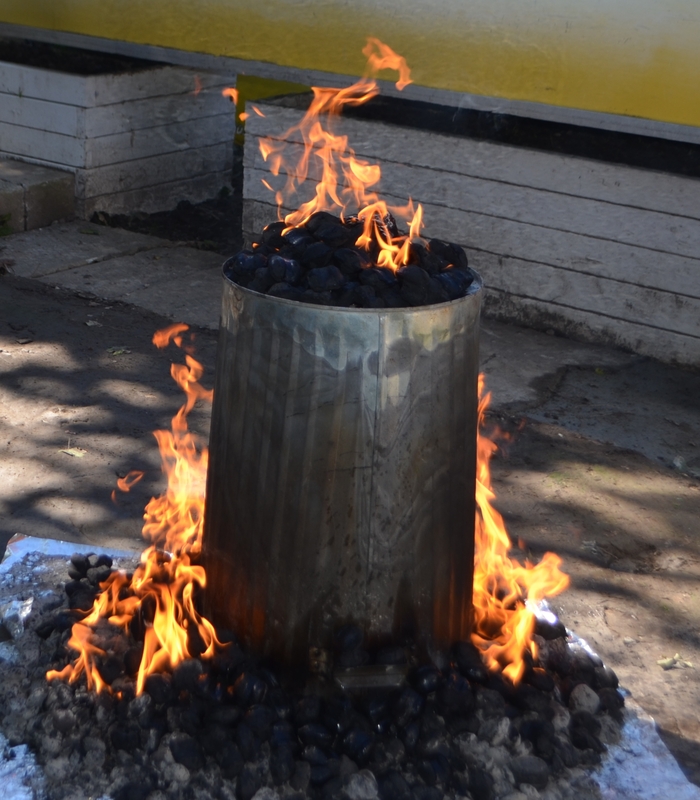 The charcoal is afire. Depending on how well it burns we may have to add more. Our Thanksgiving turkey is ready for the table. Thanksgiving weekend is also the weekend of our Wedding Anniversary, this year we celebrated 27 years of wedded bliss. Actually, we did absolutely nothing, which is quite fine with me. I am not one for celebrations, preferring small quiet get-togethers. 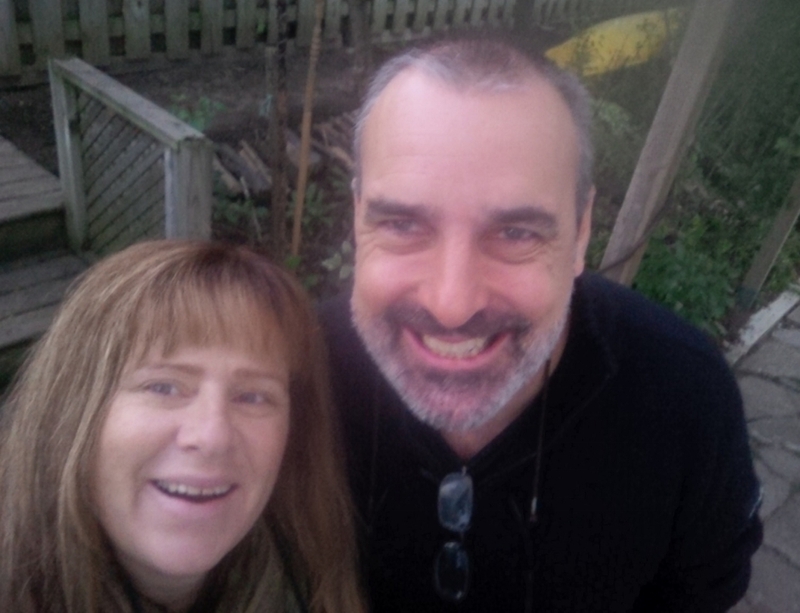 This morning selfie was taken on the day of our anniversary ~ October 10th. October has been a month of sorrow, with the murder of Cpl Nathan Cirillo. I did not know him personally, but being from my hometown, and the same age as my eldest, plus the fact he was killed standing guard at our National War Memorial, affected many of us Canadians to the core. In the past I have not attending the Remembrance Day ceremonies held on November 11th of each year, this year will be different, I will attend and thank all of those who have died for our Country. The last few weeks of October have also been quite depressing, dominating the headlines now is the alleged sexual assaults committed by Jian Ghomeshi, former host of the ‘Q’ on the CBC. Many of the arguments have centred around women not coming forward and pressing charges (as of yesterday, two women have gone to the police). From my own past experiences I understand why most women do not come forward. I was explaining this to my husband last night, and told him how my own sexual assault still haunts me, and if things had been different back then, I would have gone to the police, I do regret that but at the same time will live with my decision. More happy/sad news ~ the eldest is moving out this month, she will not be five minutes away but instead an hour. Sure we can chat daily on the phone but it is not the same as her sitting with me in the living room chatting. Thus with the other two still away at school, we can be referred to as “empty nesters” for now. This entry was posted in Anniversary, Anniversary, Canada, Canada, Canadians, Celebration, Holidays, Marriage and tagged National War Memorial, Radio Q, Remembrance Day, Remembrance Day, Sexual Assault, Sexual Assault, Thanksgiving, Thanksgiving, Trashcan Turkey, Turkey on November 1, 2014 by AlwaysARedhead.